10mm, 14mm, 17mm, 19mm, 32mm (1.25”) 7/8”, 15/16” socket. I used a ¾” when I needed two 19mm, and 11/16” for the 17mm. Obviously that wasn’t optimal, but I used what I had to save money. Torque wrench, breakers bars and/or pneumatic impact wrenches and socket extenders. It also helps to have closed and open end wrenches in those measurements as some bolt are difficult to get too. 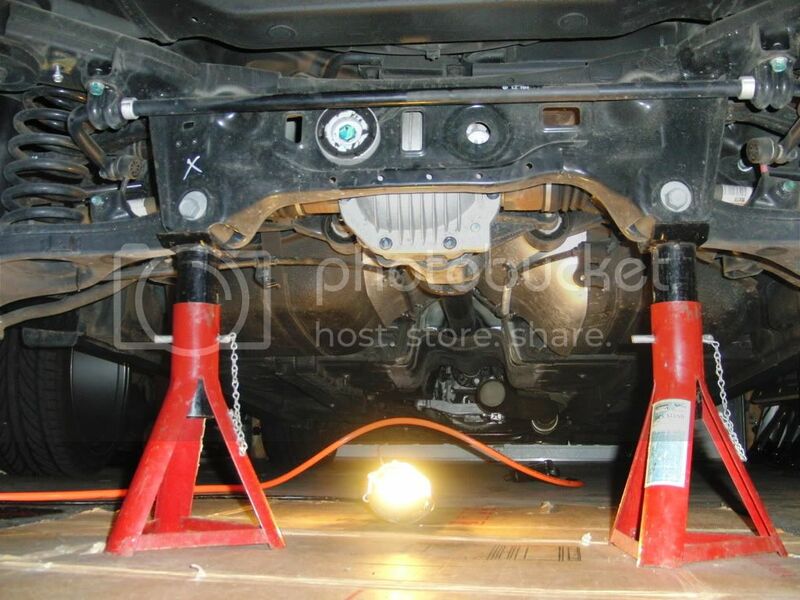 1 Jack minimum, and 2 jack stands that are rated for at least 3000 lbs or suitable car lift (body lifting not wheels). Pry bar and metal hammer and chisel and a rubber or brass ‘soft’ hammer. Scotch pad and or scraping blade. 75w-90 weight differential oil, ~1.4 quarts. 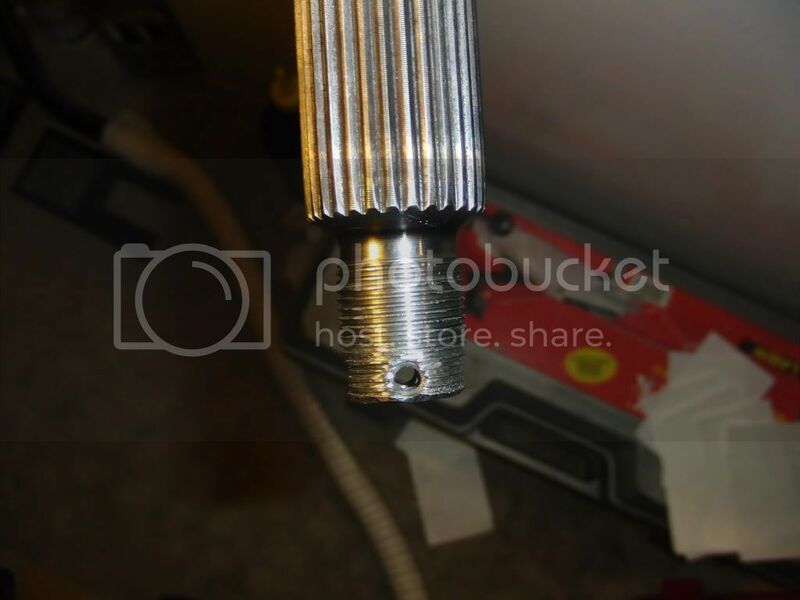 A metal rod 'punch' works well for sticking into a 25%-99% lined up holes, sticking it in and prying the holes to line up. It helps if you have a work bench or a vise or something to hold the differential case. The LSD obviously and a shim pack to go with it. Two people is HIGHLY recommended, especially for removing/installing the axles, and removing/installing the differential case. If you don’t have any of those tools, Advanced Auto and Autozone has a tool loaner program where you can buy the tools, use them for up to 45 days and then return them and get your money back. Every spec is from the HMA 2.0 service manual. I am 99% sure the 3.8 is the same, and I am only listing lb-ft not Nm or anything else but that is available on HMA. You can download the service manuals from this link (insert link) and I would advise familiarizing yourself with it and using it along with this how to. It is what I used to do this job and a bit of internet research, but I am saving you a little time by telling you wrench sizes and providing real pictures to help those no familiar and go into a bit more detail and help tell you some time saving essential details left out by HMA. Assembly is opposite of disassembly, so I am putting the specs on the disassembly. With any job it is wise to take a picture of your work before hand, in case you forget how it goes back together, and I would also mark all of your bolts with some tape and a few words. Since this is my first time, there where times that I got focues/pre-occupied and forgot to snap some photos, but I took a bunch of 'generic' pics and will use MS paint to highlight the necessary areas. 1. Chock the front wheels and set your parking brake and put it in first gear. 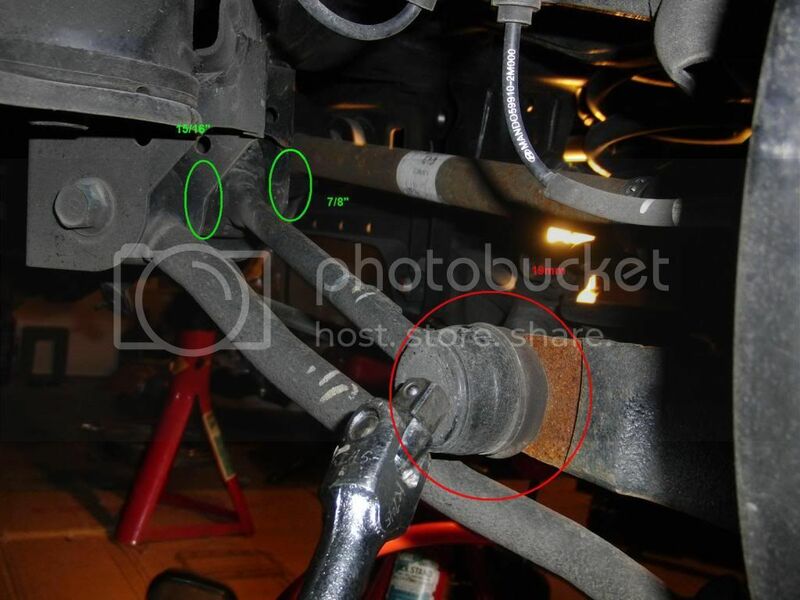 Obviously you are lifting the rear so the parking brake isn’t crucial, but it will help with removing the axle caste nut. Preferably roll the windows down too, so you can reach the e-brake and gear shifter without crawling inside a car on jack stands. 2. Jack up the car. 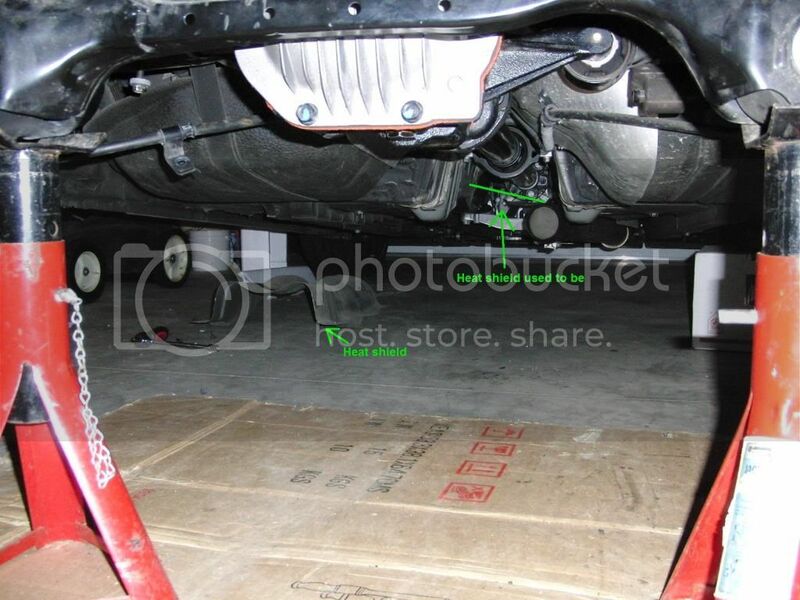 I used the back cross member to place the jack, then place jack stands like you see in the picture. If you have a better location, that is fine, just MAKE SURE IT IS A STRUCTURAL MEMBER AND IT IS SAFE TO BE UNDER YOUR CAR! I can’t stress that enough, you will be under your car pulling and some items require 80+lb-ft and you DO NOT want your car rocking or falling off the jacks, DEATH COULD RESULT FROM IMPROPER PLACEMENT OF JACK STANDS!!! I had mine on this location for a bit longer than a week, so I know they are more than fine. 2a. Remove your exhaust. I have a different than OEM exhaust so there is no need to have me go into detail on how to remove and it is pretty simple anyway. Unbolt the 2 bolts flange after the secondary catalytic converter, pull the rubber hangars off the car, you might need some lube and take off the exhaust. You might want to get a new gasket for re-installation. 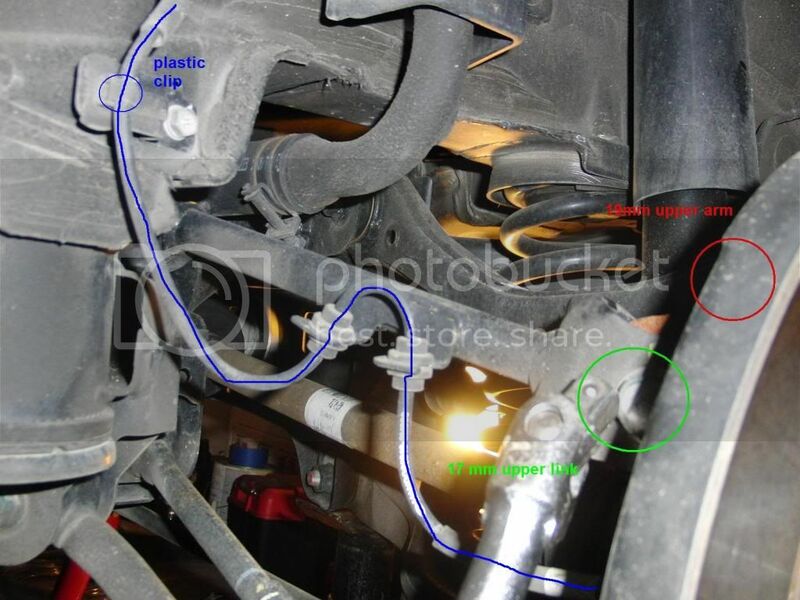 I am not even sure if the jack stand location will work for removing the OEM exhaust, so you might need to put your car on drive-on ramps or something to get to your exhaust. 2b. 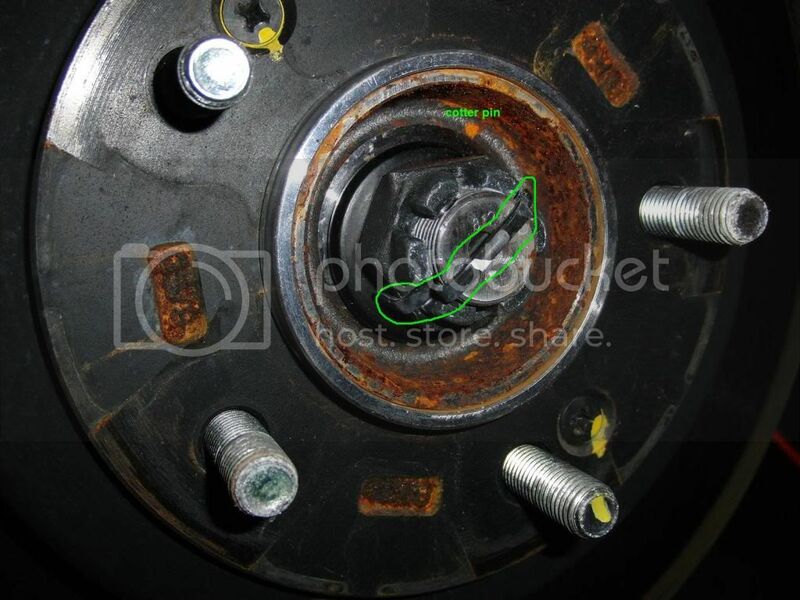 Remove 6 bolts (10mm) on your heat shielding so your drive shaft center post can be seen/worked on. I just tightened them snug. And while you are under there, I removed both e-brake cable bolts show below (.5”/12mm) just to give me more slack, it might not be necessary for all. 2c. 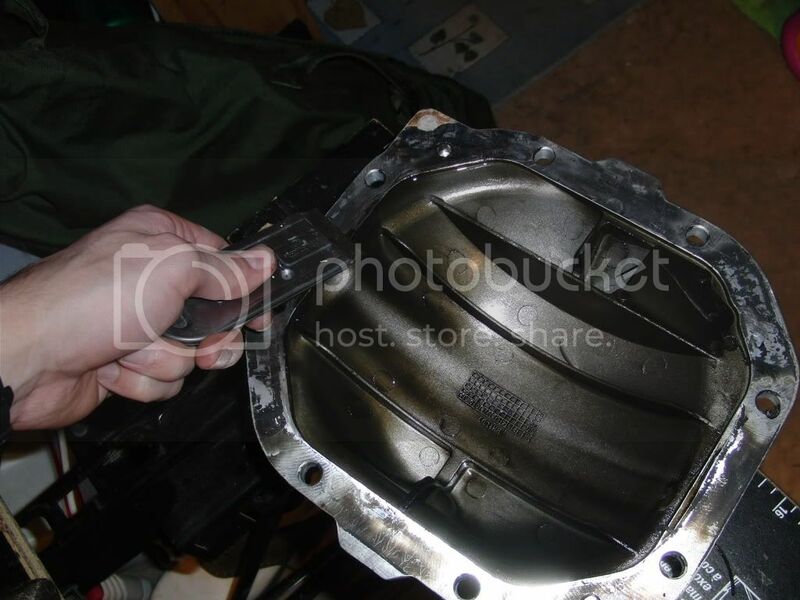 While you are under there, grab a 7/8” socket and a drain/drip pan and take the drain plug out and drain the oil. 3. Remove the wheel lug nuts. Tightening torque 65.1~79.6 lb-ft.
4. 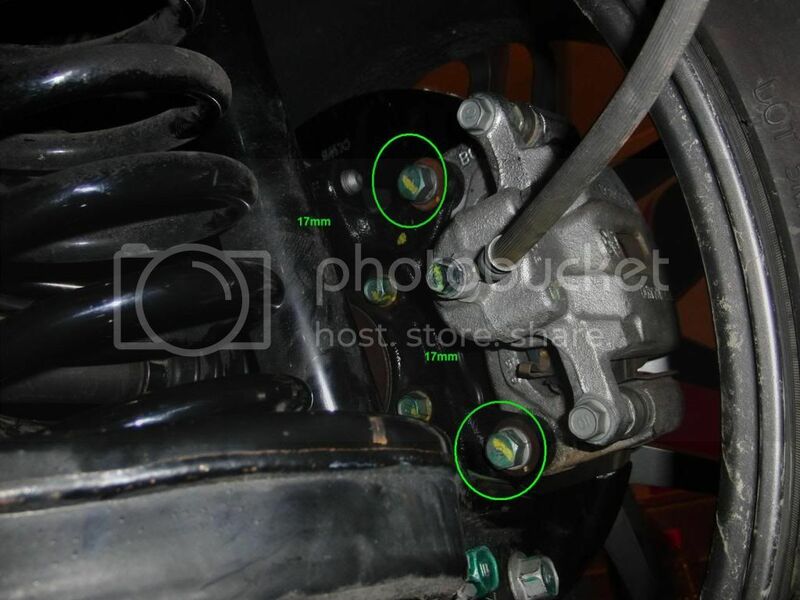 Remove two brake caliper mounting bolts (17mm) and tie the caliper up by anything so that it has no hanging stress on the hose. Tightening torque 36.1~43.3 lb-ft.
You can see slight tension on the brak cable ( I should have had it a bit higher, but the whole weight of the brake caliper is no resting on the hose. 5. 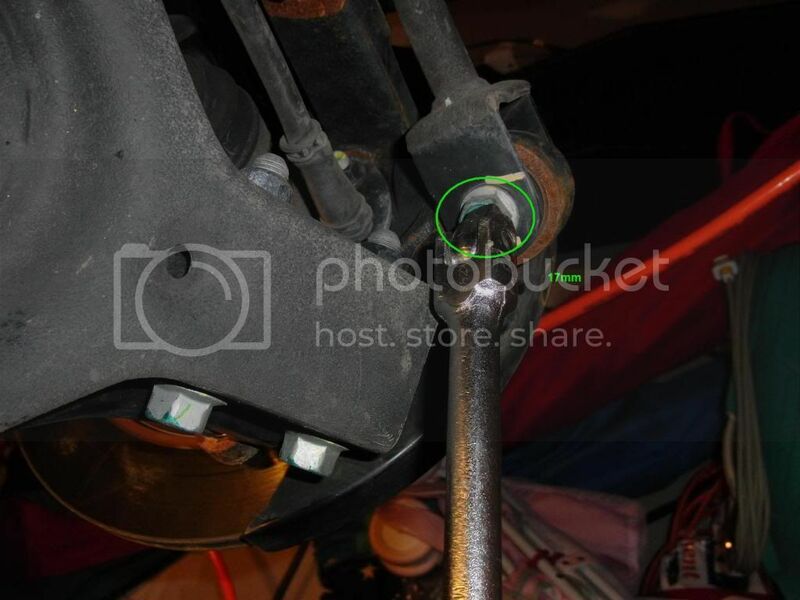 *Remove this split/cotter pin by bending the ends up so you can pull it out of the hole. Then loosen the axle castle nut. Tightening torque 144.7~188.1 lb-ft *This can be an optional step depending on how many tools, and the room you have under your car though I had to. Take care to notice the washer direction and possibly mark it if you have a hard time telling which is flat and which is convex. The convex side needs to face outward so the flat side rest against the rotor side. 5a. 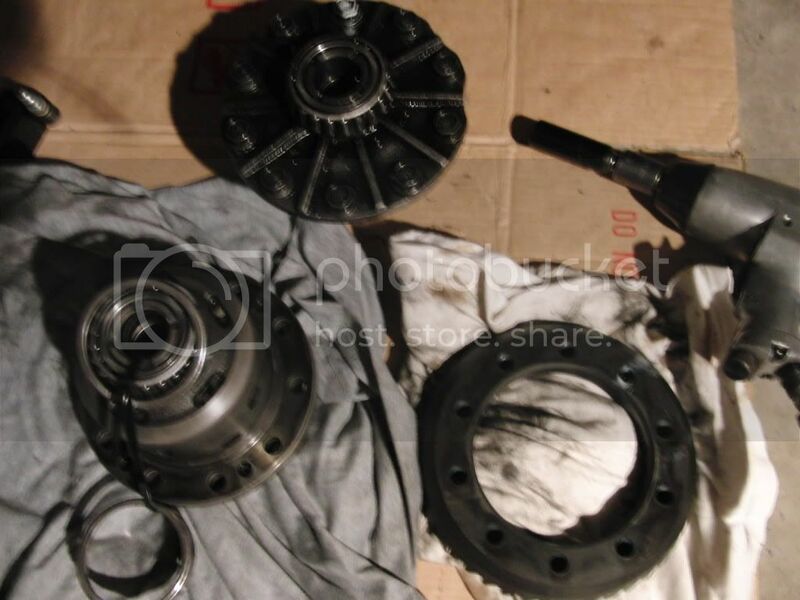 *HMA tells you to go to their brake section and remove the rotors and e-brake though I couldn’t get off my rusted rotors so I am not going to include that. 9. HMA tells you to remove the wheel speed sensor, but I thought it was easier to just disconnect the connector, so I just did that. Less torque specs and sockets to deal with. The blue line is the cable, you need to pull the two rubber holders out and the plastic clip, and then the actual connector. 10. *The next step is to remove to bolts holding the e-brake cable. If you haven’t removed the rotor, chances are you won’t be able to do this. HMA isn’t clear at all, but I would imagine you release the e-brake cable somewhere behind the rotor. This just means you won’t be able to completely pull your hub off, but I just put a bucket or a box or ramp or something that can hold the hub (attached by your e-brake cable) but off to the side so you can later remove the axles. 11. Remove the upper arm and link mount bolt and nuts (19mm for the upper arm, 17mm for the upper link). Tightening torque 72.3~86.8 lb-ft. These are the last thing (minus your e-brake cable attached to your car so have a support underneath ready to support the wheel, I used a rhino ramp to hold mine. 12. 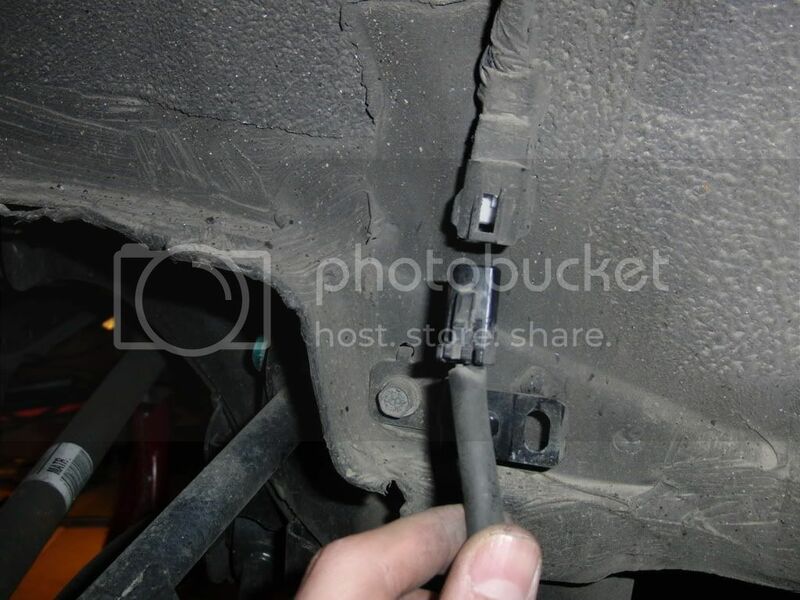 Use a pry-bar and stick it in between the hub and the axle and pry the axle out. My driver’s side came out easy, the passenger side… not so much. Do not use a sledgehammer to knock out the axle, you will mushroom it and not be able to get the bolt back on unless you get it machined. 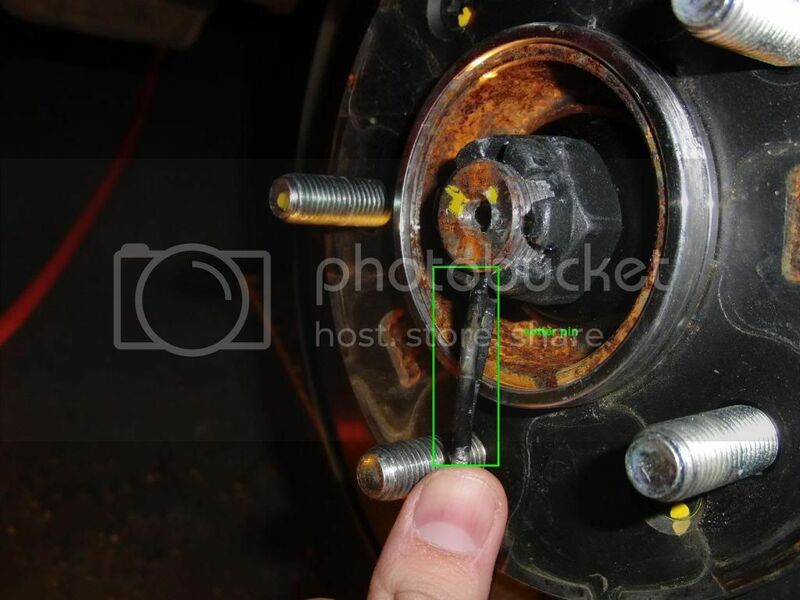 I think there is a tool that bolts to your hub/wheel bolts and you screw to push the axle out and you might be able to get on from the auto stores loaner program. You pretty much need two people for this step. 13. 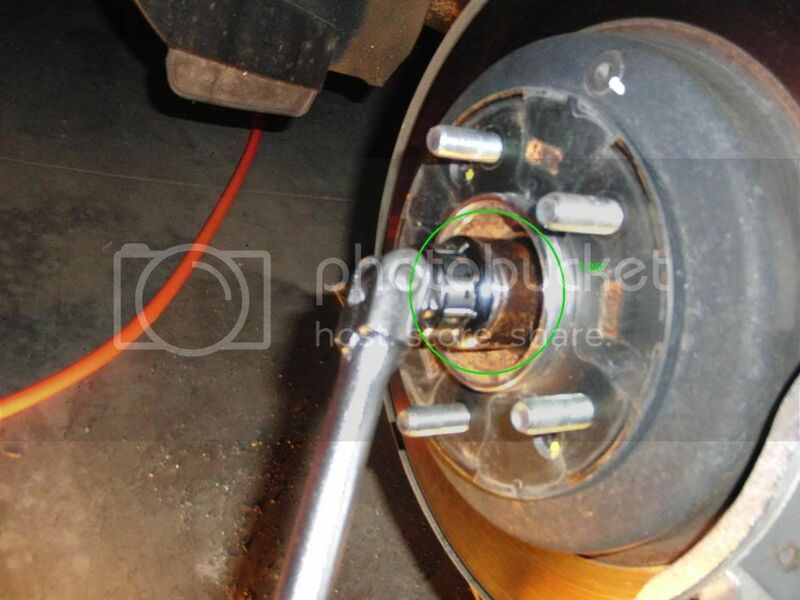 Use a pry-bar again to pry the axle out of the differential. Be careful not to go to deep and jack up your seals, unless you bought new seals for this, but I didn’t. Move the axles out of the way, Possibly cover the ends with a plastic bag or something just to prevent dust from accumulating on the oil seals. 14. Mark all of the drive shaft bolts (I used a blue permanent marker, but I think a lighter color might work better) and I put 1 tick mark on one bolt, 2 ticks on the other and 3 ticks marks on the last one as well as the rubber damper, the drive shaft propeller bolt housing and anywhere you think necessary to make sure you place them back in the same place. I think you drive shaft is balanced and that is why this is needed. Also HMA says to use an 8 point hex socket, not a 12 point or anything that will increase the chances of you ‘scuffing/rounding’ the bolt head. The black headed bolts face the back, the silver ones face the front. So I had 2 pairs of 3 bolts with tick marks. Also marked the rubber damper in between the shafts (chances are it will fall off) with tape and marker as if you just use a marker the paint flakes off and your markings go with it. 14a. Since I have a dial indicator, I measure the drive shaft runout (0.3mm (0.012in.) so I could measure when I am done and make sure everything is back. Mine measured .005”. 15. Break loose all of the bolts (19mm). Tightening torque 65.0~79.5lb-ft. I had to use a thin close end wrench to hold the nut on these. 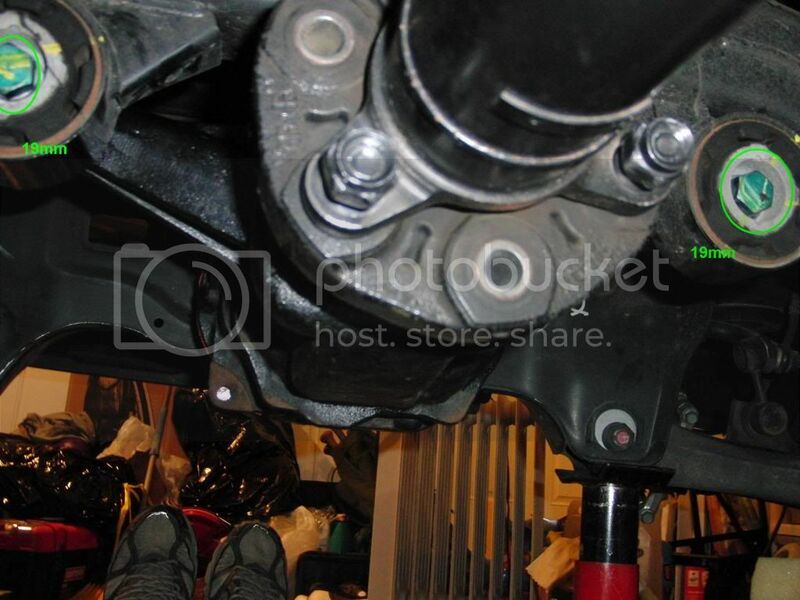 Again it helps to have a friend reach through your window, and put your car into 1st so the drive shaft won’t move (as much it can still move) so you can break them loose, then, have them put it in neutral so you can rotate the shaft and repeat on all 6 bolts. One nice thing that makes sense if I think about it, but HMA failed to annotate is that the black headed bolts are REVERSE THREAD. Saving you from killing yourself to get bolts lose by going the wrong and finally giving up and saying, well it can’t hurt going the other way. You can loosen them the whole way, but you can’t take the black ones off yet, but take the silver ones off. 16. Loosen the drive shaft center bearing bracket (14mm or 17mm I forget). And let it just hang (it falls about 3-4”). Tightening torque 65~79.5 lb-ft.
17. Now back to the driveshaft coupler near the differential. You can push the drive shaft towards the front of the car and it has about 2-4” of ‘play’ so you can take the bolts off and take the driveshaft off the differential propeller. 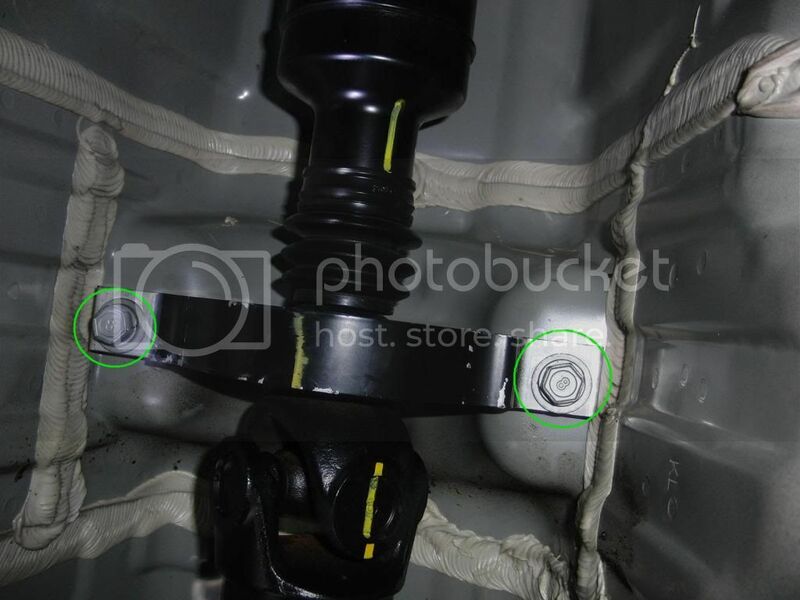 The driveshaft has to be turned so the black bolts can be pulled out at ~10:00 or 2:00. I rested the driveshaft on a box so it has less stress on it and bolted back the center bearing bracket again to reduce undue stress. 19. I luckily had a workbench that ended up working perfectly to hold the differential case and had existing holes at the proper distance so I could bolt the case to it. It made the next few steps much easier. Take all the differential cover bolts out. 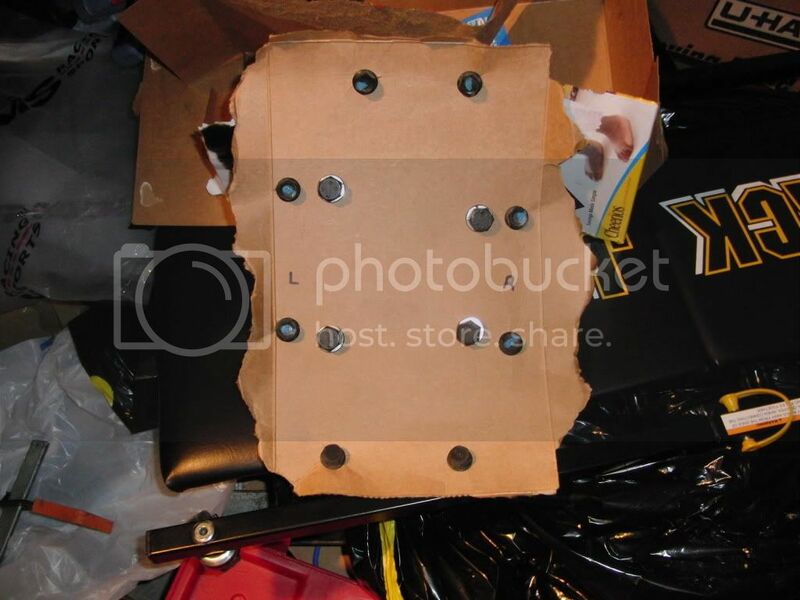 Tightening torque 28.9~39.1 lb-ft I used this cereal box to keep the bolts locations, it might not be that important to do, but I did it, and it prevented them from getting lost. 19a. I used a chisel and a hammer and went around the edges until the cover came off. 19b. I used a razor blade to scrape off the majority of the gasket and a scotch pad to get the rest off. 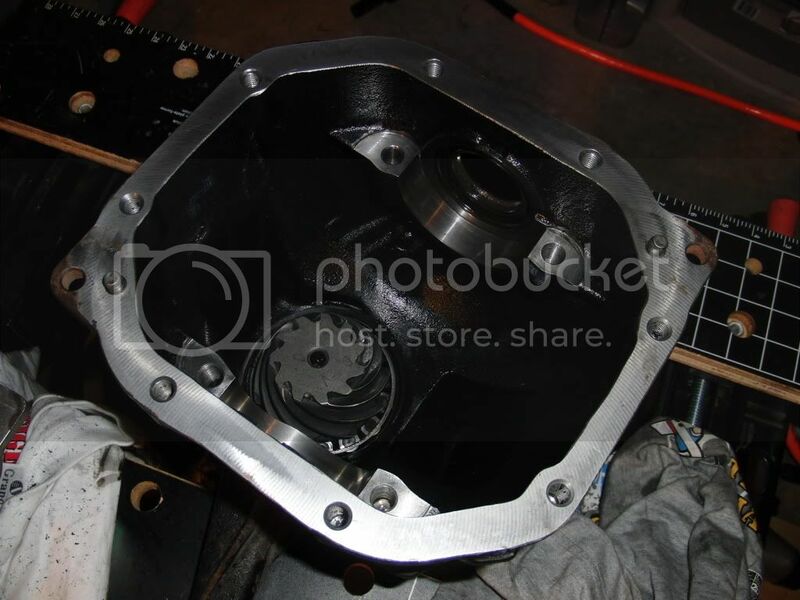 I would put a shirt of a rag into the differential case to try to catch the gasket shavings. Though when I was done cleaning all of that, I used brake cleaner to clean it out really well, then dumped it. 20. Before disassembling differential case assembly, paint match marks on one side of the bearing cap so you know how to put it back together. Take the bearing cap bolts off (I forgot the socket size but I think 17mm) and from this point on have a left side and a right side ‘pile’ for stuff. 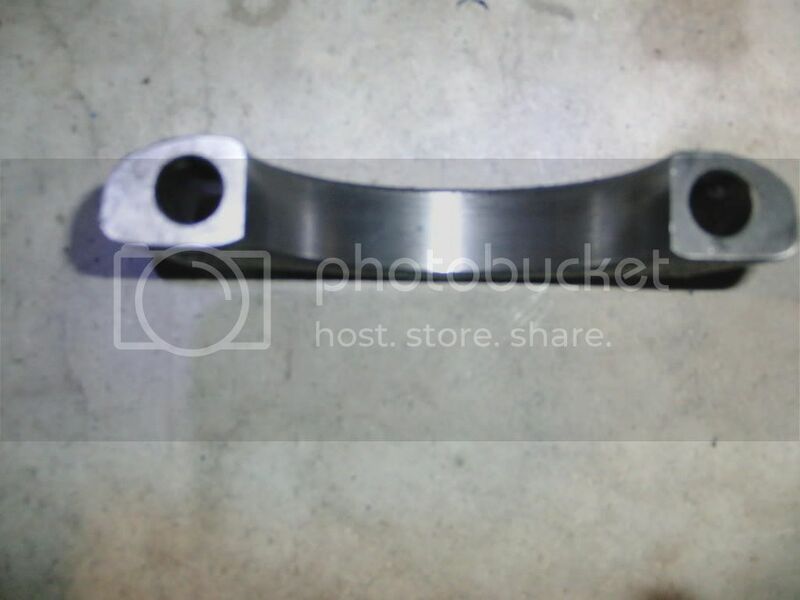 If you decided to buy new bearing caps and bearings and bearing races, this isn’t needed obviously, but it will increase the wear of your parts if you don’t do this as they all ready have a set wear pattern and are broken in this way. I couldn’t find torque specs on these, so I used 40 lb-ft. The shims you can take keep separate sides, but this really doesn’t matter as chances are you will be using different shims to fit the new differential in. My LSD came with side bearings and races and I placed them accordingly left and right. 20a. I measured my backlash since I had a dial indicator and also painted my ring gear to check the pattern. My backlash was .005” and (Standard :0.10~0.15mm) and my pattern looked too close to the tip. Though the pattern is extremely difficult to see, the gear marker paint didn’t work very well at all for me. Some pitting I had on the face of the cover. 20b. I used two pry-bars to dig in one of the arms that covers the spider gears to pry out the open differential. Have a friend there to catch the most likely to fall off bearing and races. 21. Take off the ring gear bolts, this will probably require an impact wrench or a vise to hold the differential (not recommended) and a breaker bar. I have heard these can be very difficult to remove and some need to buy new ring gear bolts after removing them, I used a cheapo 250lb-ft impact and they came right off. I also took them off in an opposite clock (opposite sides working around), I don’t know if that is necessary, but that is what I did. 22. Take your rubber hammer and tap the edges of the ring as you rotate it until it falls off. Obviously, have something to catch the ring gear. I have heard this can be very difficult too, though mine fell right off the second the last bolt came off. I cleaned the blue loctite off the bolts the best I could and inside the ring gear. 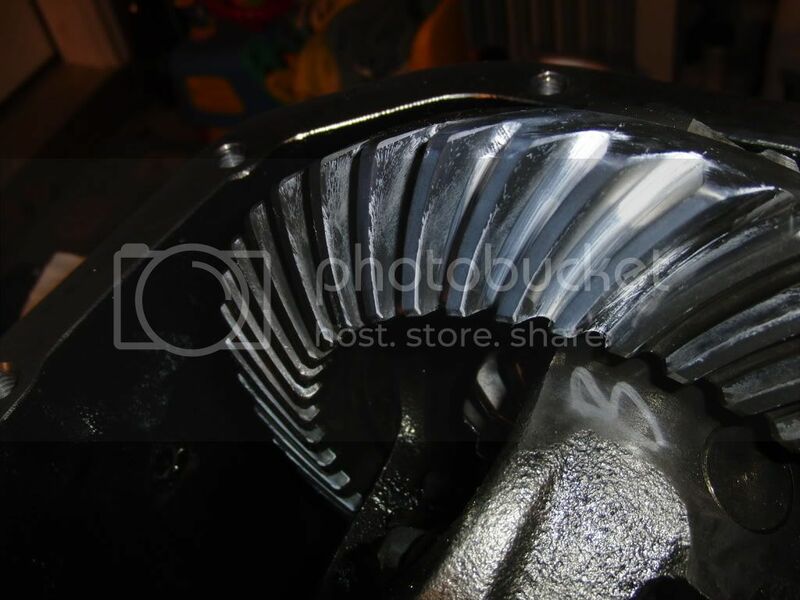 I also cleaned all of the gear marker paint off the ring gear and the pinion inside the differential case. I also cleaned the pinion from the gear marker. My right side bearing cap has a bit more wear. It was my drive side, so that could be due to having an open differential, or possibly Hyundai didn't tighten my bearing caps tight enough. Half way point, if I was HMA, I would simply say, install reversal of removal…..
23. Place the ring gear on your new LSD. This can be more difficult than you would thing to try and get it on and line up all the bolt holes. I used the rotating opposite pattern again, making all botl finger tight, then starting athe 12:00 and 6:00, then 1:00 and 7:00 and so on, then go around from 12-12 to make sure everything click (if you have a click type torque wrench). 24. HMA doesn’t say any torque specs or anything on this. I have done research and most say use red loctite and at least 40 lb-ft of torque, so that is what I did. Maybe that is why they are so difficult to get off though. 25. 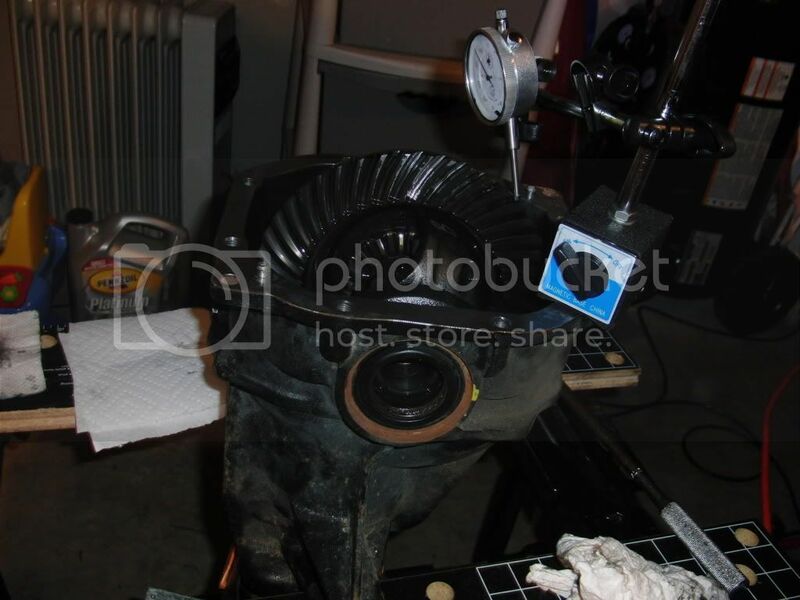 Put the new LSD in your differential case having a friend hold the bearing races on. 26. Put shims between the bearings and the differential case and this takes some guessing and checking. 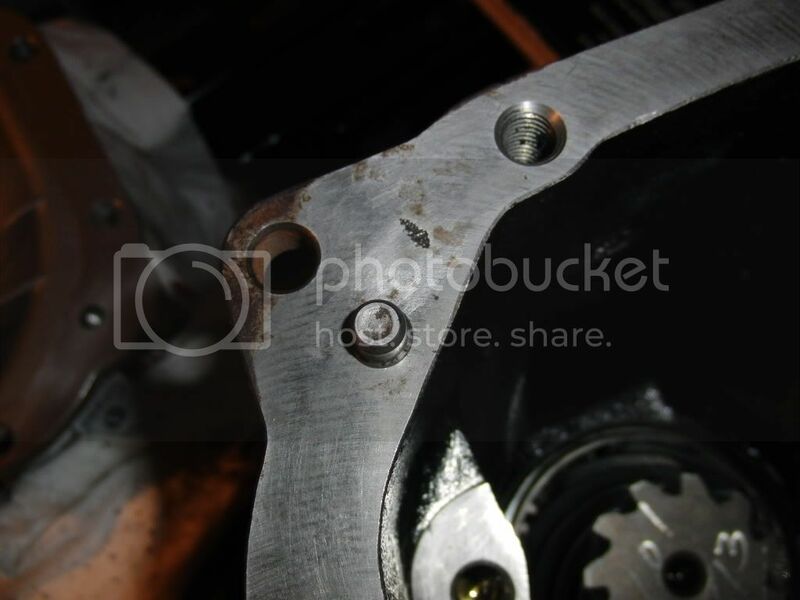 You want to vary between thin and thick shims so that your differential is held in place and doesn’t wiggle around, but you also want to have a good contact pattern. You can look online for what contact pattern means what. Paint your 3-4 teeth on your ring gear and using the ring gear, spin it around 2 times to get a pattern. It is pretty common sense, you want it to be in the center up and down, and don’t want it to be right on the tip you want it further down. My pattern was good, so I didn’t need to adjust any pinion shims or pull anything apart down there, just use some different shims on the side bearings to get a good pattern. I put the bearing caps on to before I tested my pattern. 28. After making sure my pattern was good and my backlash, I pulled the LSD out and cleaned the gear marking paint off of the ring gear and the pinion, then placed it back in. I couldn’t find torque specs on the bearing caps, so I used 40 lb-ft.
29. Now with your cleaned off cover faces, apply some RTV, it should have directions on the tube, but I put a small bead on both faces and spread it around with my finger until the whole face was covered, but not so much that it squirted out when closing and bolting it down. Try to do this as fast as possible, but you have an hour until it is dry, though it shouldn’t take more than 5 minutes. Place the cover on and tighten bolts hand tight. 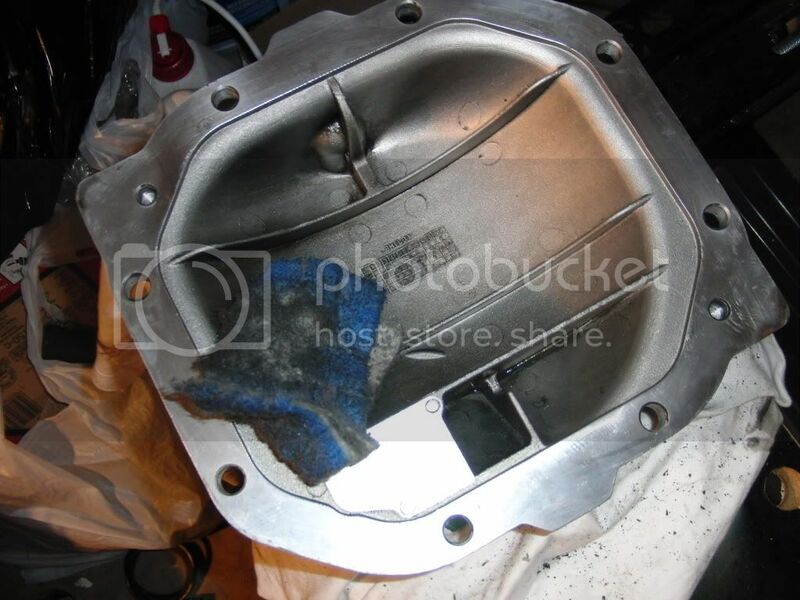 The differential case cover can be placed on two ways, one wrong and one right, but it is symmetric looking, make sure the pressure cap/air breather goes up, and the drain plug is obviously down. Then wait an hour, and then tighten to spec. Tightening torque 28.9~39.1 lb-ft It takes 24 hours to cure, so I didn’t add any oil for 24 hours. I took the air breather off and made sure it was clean, as a dirty cap can seal in the pressure and blow your oil seals. Tightening torque 7.2~14.4 lb-ft. I also used the 'star pattern' method of tightening bolts. 30. Put the differential back on the jack and again work carefully to get it back on. This will take some finessing as if you placed it where I suggested, it is a little back heavy (but the best COG I could find and still have good support. It might be easier the closer you get to the jack and differential, but it is safer if you are not under it in case it falls. At this point I just tightened all bolts to what felt snug ~50lb –ft. I waited to finish (just before putting the tires back on) then went down a check list and tightened everything to spec. 31. Loosen the drive shaft center bearing bracket again(14mm or 17mm I forget). And let it just hang Tightening torque 65~79.5 lb-ft.
33. At this point I tightened the drive shaft center bearing bracket to spec Tightening torque 65~79.5 lb-ft. and placed the heat shield back on just to get it out of the way. 35. 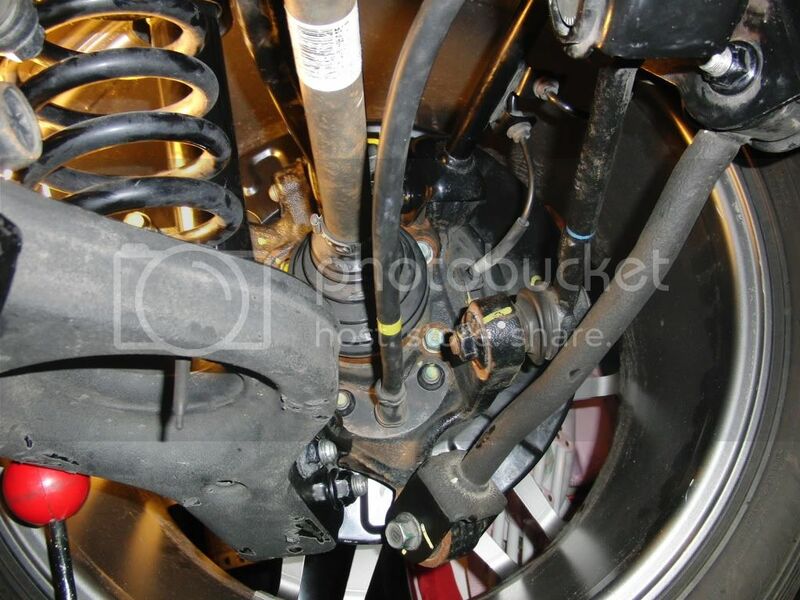 Now have a friend hand you the axle while you are under the car and feed it into the differential case being careful not to damage the oil seals. It should look like this. And then help him feed the axle shaft into the wheel hub. It might not go in very far, this isn’t a big deal, as you can put the axle nut on shaft and tighten it forcing the shaft on fully. From now on, you basically need to hold your rotor the whole time until you get some suspension hooked up to it. Here is a mushroomed axle that I dremeled back to working, but it took about 4 hours. I had to grind down the mushroomed head, then use the cutting tool the make 4-5 of my own threads and the holes there for the cotter pin makes it that much harder. So again, don't use a sledge hammer to remove. 36. For me this was the tricky/most difficult part. You can do it in any order you wish, HMA recommends the reversal of removal, but this is what worked for me. First, set the parking brake so you can grab the rotor without it spinning on you. 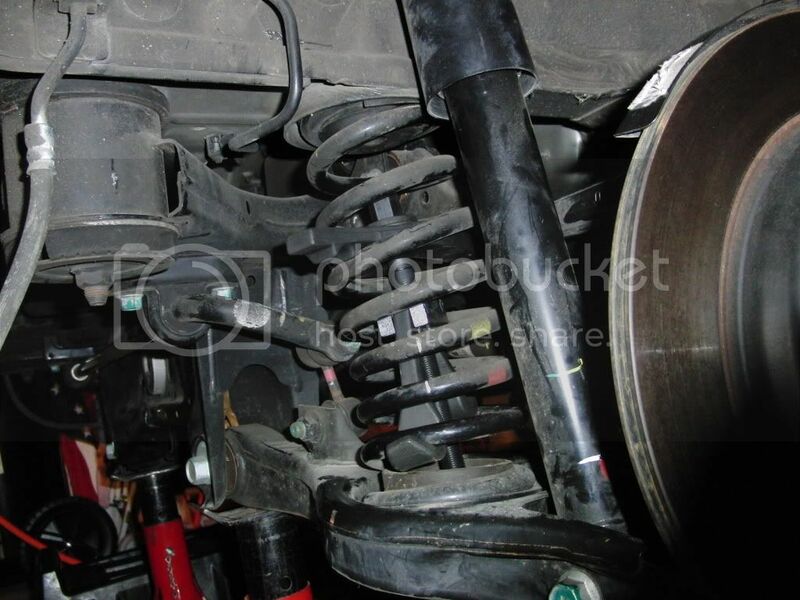 I used a spring compressor to compress the suspension spring and remove it to make this much easier. 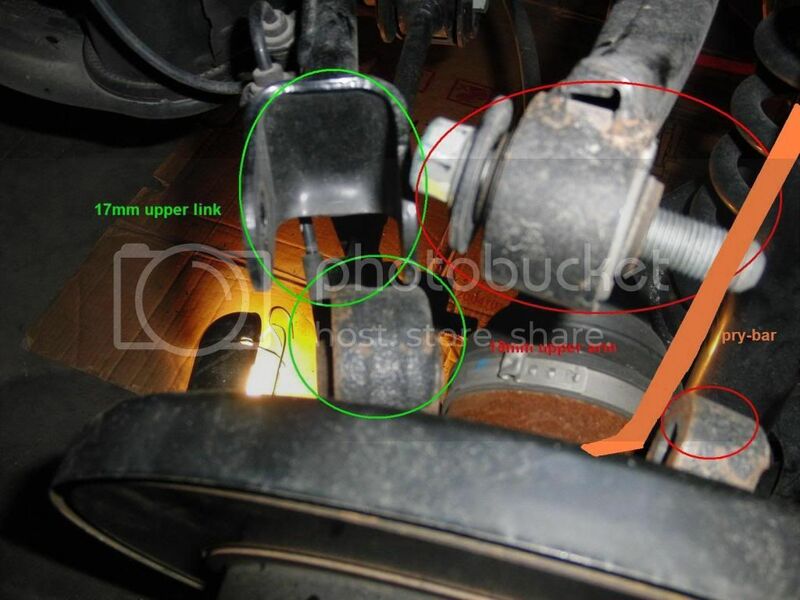 Also, remove the lower strut bolts (19mm) on the lower arm. Tightening torque 101 ~ 116 lb-ft for the lower arm. 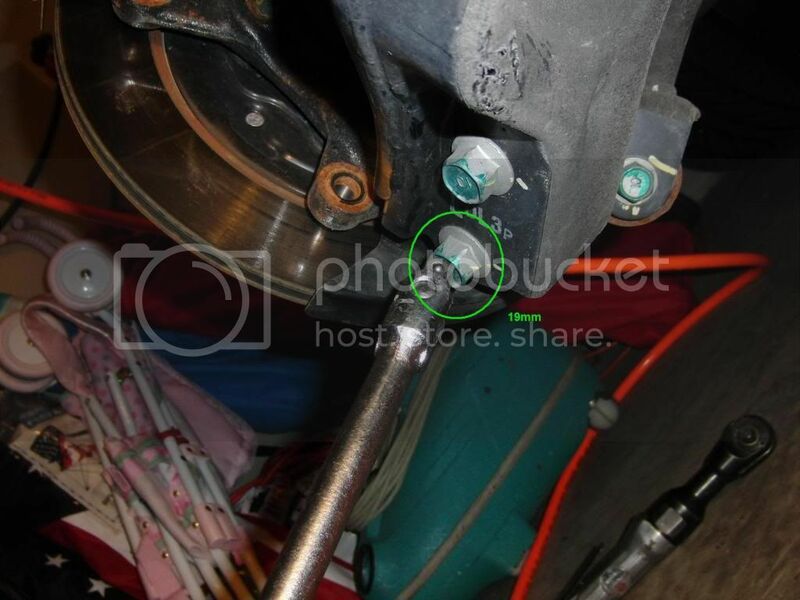 Remove the upper bolts (14mm) Tightening torque 32 ~ 43 lb-ft. And pull the strut out and set it aside. Now your lower arm should be more flexible. Read the direction carefully and follow them as a compressed spring can punch a hole in your car or kill you if you are not careful with it, there is a lot of energy stored in those. Reference pic of how everything goes together. 37. Lift the rotor up (I placed my jack under the bottom most knuckle that goes into the lower arm to assist) and feed a bolt (19mm) through the upper arm and start to thread it though the hub knuckle. I also fed the 17mm bolt through the upper link knuckle to take a bit of weight off. 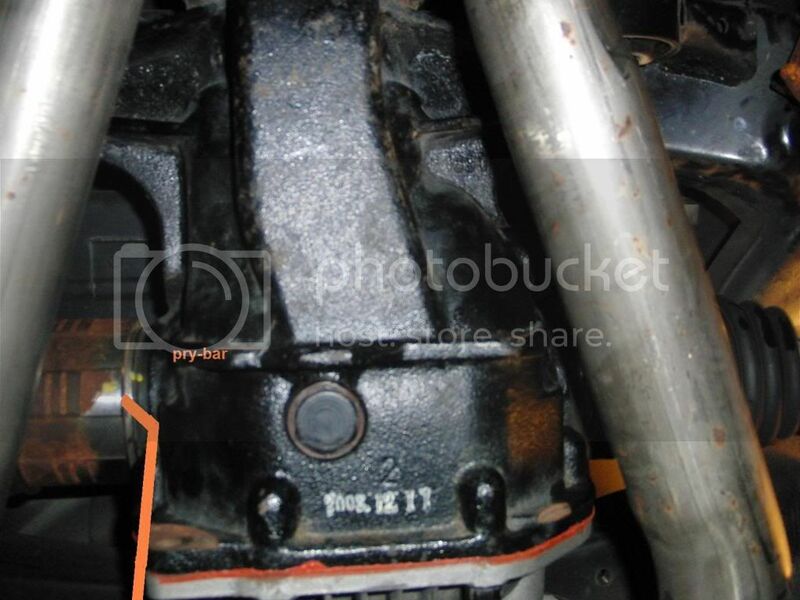 Again, just tighten snug with a wrench, for now, don’t worry about specs, if you didn’t notice all 4 suspension links are the same at the hub at Tightening torque 72.3~86.8 lb-ft. The 5th link is the lower arm and that is a bit higher. 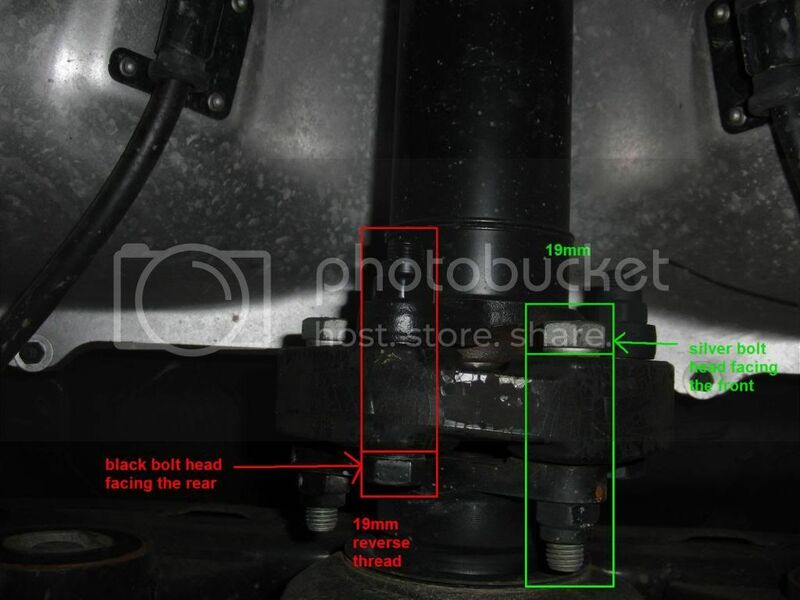 If you did end up pulling the cam bolt as I did, make sure it is ‘fed’ into the support bracket as once you put the upper mounts on, if it is below it, you can’t get it in. 39. Attack the lower trailing arm 17mm. Tightening torque 72.3~86.8 lb-ft.
32. Place your spring back on the lower arm and remove the spring compressor. 33. Place the washer convex side out flat side in, and the castle nut back on the axle pulling it fully into the hub if you didn’t need to do this already to get the suspension to fit. Tightening torque 144.7~188.1 lb-ft and place the a new cotter pin through the hole and bend it back around opposite sides. I tightened mine 150lb-ft as at 180, the hole was covered so I couldn’t get a cotter pin through. I would try starting at 150 and working up until a hole is visible, and it helps wrapping the cotter pin if you had to struggle to fit it though the hole. I ended up reusing one of my cotter pins. I grabbed it with some pliers and pounded on the pliers with a hammer to feed the old bent pin through. But once through, it wouldn’t twist and it made bending the ends much easier. My other cotter pin, I got ahead of myself and forgot to remove it and it shredded when I was taking my castle nut off so I had to buy a new cotter pin at an auto store to put in. It slid through the hole with no effort, but it was very difficult to bend it as it wanted to rotate around. 34. 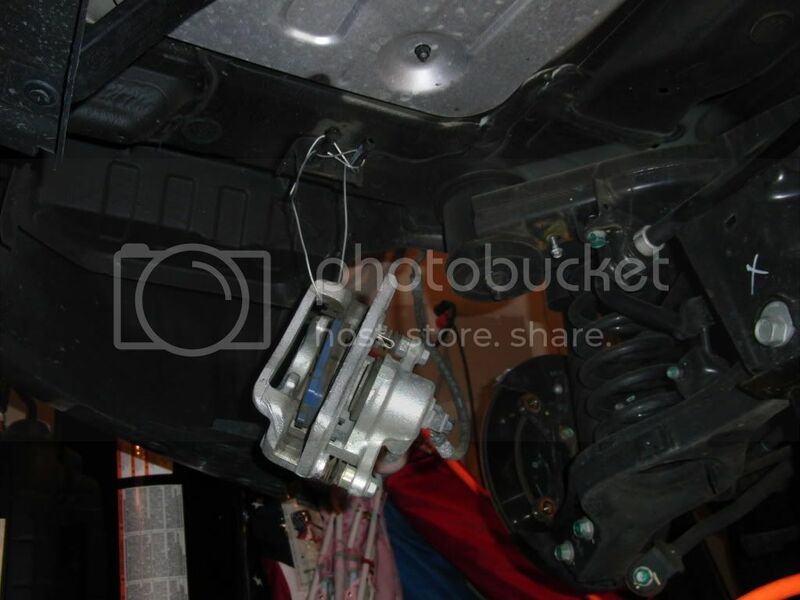 Take you brake caliper off its hangers and install it back on your rotor. Tightening torque 36.1~43.3 lb-ft. two 17 mm bolts. At this point I went through and tightened everything to spec and marked it off for right and left on a piece of paper. 36. Put your wheels back on and tighten lugs to spec. 65.0~75.6 lb-ft Use the 'star pattern' method of tightening bolts. 37. Raise the car off the jack stands and slowly lower onto your tires. I have been told by others that did this job you can skip a few steps. 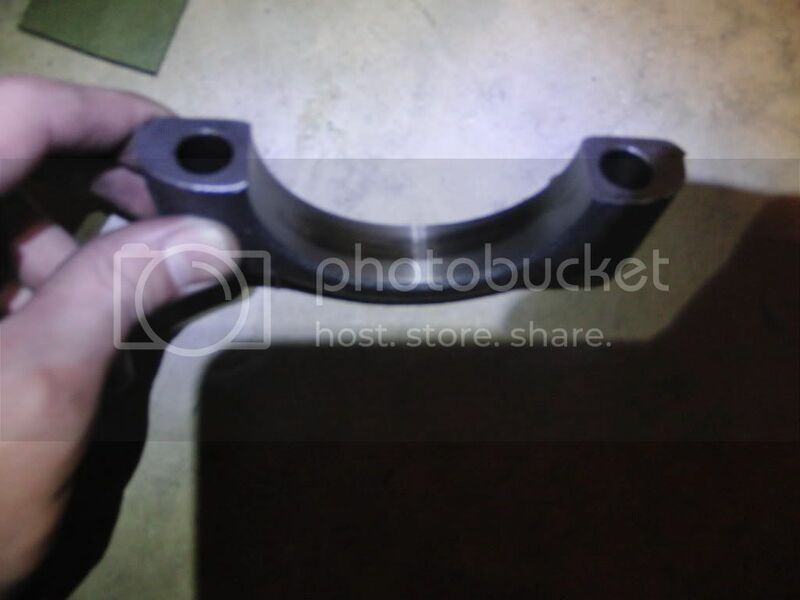 You don't need to remove the axle nut or the axles from the hub or the driveshaft center bracket, if you have the room and proper tools/lifts, you can just lower the diff and as you are doing that, it will be able to pull off the driveshaft. Nice write up dude. Did you need to do readjust anything after putting it all back together? Or is it a true plug-n-play install? This is quite an impressive write up! Props!!! Thanks, the only adjustments I needed to make was the shims. The unfortunate thing i syou have to buy 8-10 shims (unless you can afford to have your car on the lift/stands for a week or so to order some after measuring) to find one that works for you. But the diff swap was pretty easy, it was taking off the pumpkin with a car on jack stands and the suspension that gave me teh hardest time by far. Though I have done my suspension 6 times since then and I have no problem with that now. I think G&M sells the Quaife which is as plug and play as the OEM torsen, but I think the Quife needs the diff side bearings which I think might involve a press. But I am so mechanically uninclined and I did it, I can't imagine anone not able to do this if they have all the tools they need. Thanks for the write up. I'm gonna install my coilovers and swap the diff to the 3.9 lsd from a 2.0t MT at the same time. I might as well do it all at once and save time since the rear suspension will be disconnected anyway. Would a direct pumpkin swap work? Or would I have to crack the pumpkin open, scoop out the guts, swap, and then install? Ive done this swap quite a few times. You can change pumpkin for pumpkin. once you have done it a few times its very easy. I dont even unbolt the brakes. Unbolt one side control arms, suspension links, and exhaust. unbolt the diff pop the axle out on the side you unbolted the suspension links on (only from the diff let hang off to the side). Shift diff over to side you removed the axle from pop out other axle, drop diff repeat in reverse order.